Facebook has rolled out the ‘Trusted Contact’ for all Facebook users which is the Facebook Account Recovery Feature. Incase if you lost your access to your Facebook Account, this new feature will help you to log in to your account with help of your Trusted friends who have spare keys. 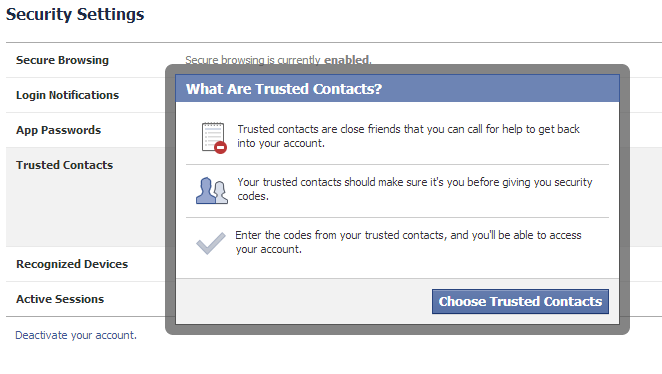 Trusted Contact feature has been introduced as “Trusted friend” way back in 2011. Now It is redesigned, improved and named “Trusted contact” with better security. To use this feature, you have to select your close (Trusted) friends from the security settings. If you can’t login to your Facebook Account? Just call the three friends you have added in the Trusted contact settings page. The Facebook will send the Recovery codes to your Three friends and instructions to help you to get access back of your Facebook. Once you get three recovery codes from your friends, you recover your Facebook account. With trusted contact feature, you don’t have to remember your answer of your security question and no more recovery forms to prove that you are a real person of that account. Now you can recover your Facebook account with help of your Friends. To get set up, visit your Security Settings, where you can select three to five friends to be your trusted contacts. Once you add the Trusted Contact, your friends will be notified about this for the security purpose. However when you remove the particular friend from Trusted Contact, he/she won’t be notified about the removal. Would you use this feature in your Facebook with your Friends? Do you have any thoughts about Trusted Contact share with us. ?